Click on the image here to watch my video for Livestrong.com on How to Do a Scorpion with a Straight Legs with Melini Jesudason. 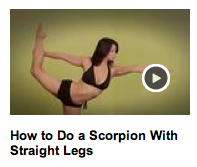 Hi, I’m Kiki Flynn and this is how to do a Scorpion with straight legs. Extreme flexibility isn’t just for circus performers and gymnasts. Take your flexibility further when we bring Yoga to this gymnast’s pose and develop incredible balance and tone. We begin with a lunge to get an extension on the back leg. And so, with our Yoga breathing, toning the waist and stretch along the top of the quad, down, down, down, shoulders are at ease. And now to engage the quad in a contraction. To have that action as well, we’re going to turn our five toes under. Use your core strength as you straighten up back leg. And with this firm pushing back leg, steady breath. Start to lower the back, firm, straight leg to the floor. Even breathing, easy shoulders and place your knee and very carefully release down and rest. Now, we’ll apply the benefits of our lunge prep to the straight legged Scorpio Pose. And let’s inhale, prepare, take hold and extend your arm, even breathing, steady gaze Up you go with this pointed foot. Now, we’re going to flex that foot and pull as we did in the lunge. And now point and squeeze straight, steady, full breathing. And there we have it. Straight legged and slowly and steadily return to your neutral standing position, and excellent.